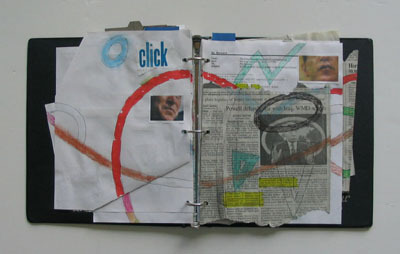 Inside page spread. See other photos below. This album was compliled during the winter of 2003-2004. It is a commentary on G. W. Bush's words and deeds. 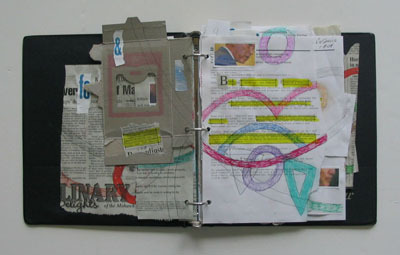 I have used press clippings and other printed media to create this mixed media collage. 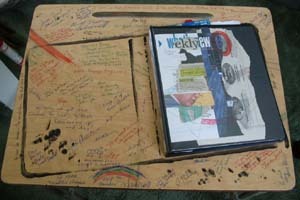 Lip Service media album mounted on classroom desk was first exhibited in July 2004. Lip Service media album is made up of media clips, art and collage elements that document and comment on G. W. Bush's misleading statements and hollow promises during the winter of 2003-04. At the exhibit I asked people to sign the desk and write a comment to add to the collage. 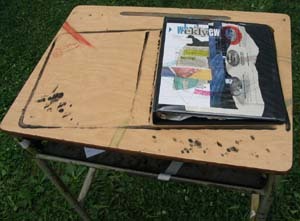 Media albums are collage binders that capture a certain timeframe. Some have a theme. Some are more scapbook in nature. The physical media band collage albums can be wall-mounted and displayed in home, office, museum or gallery venues.